For Professor of Geology Eric Grosfils, the scorching planet Venus is a “volcanologist’s playground,” where interpreting well-preserved geological records could help lead to better understanding of volcanoes here on Earth. Now, a $425,000 NASA research grant will allow Grosfils—the Minnie B. Cairns Memorial Professor of Geology at Pomona—and his research colleague, Pat McGovern from the Lunar and Planetary Institute, to push forward with their efforts to better understand the evolution of stresses within and beneath a volcano as it grows. Their latest grant, awarded by NASA’s Solar System Workings division, provides funding for three years of research and will include a range of new opportunities for student involvement. For instance, students who are just starting their geology education can help perform GIS mapping and analysis of Magellan radar data—work that will help the research team “evaluate the sequence of eruptive events, as well as what structures were forming when, at several large volcanoes on Venus.” More advanced undergraduates can take on more challenging tasks, such as numerical modeling. In his research as a physical volcanologist, Grosfils investigates the mechanics of magma reservoirs—bodies of potentially eruptible molten rock within the subsurface—and what causes them to destabilize. The question is an important one because knowing when and how a reservoir destabilizes and ruptures is critical to efforts to understand whether escaping magma is likely to move toward the surface and erupt. 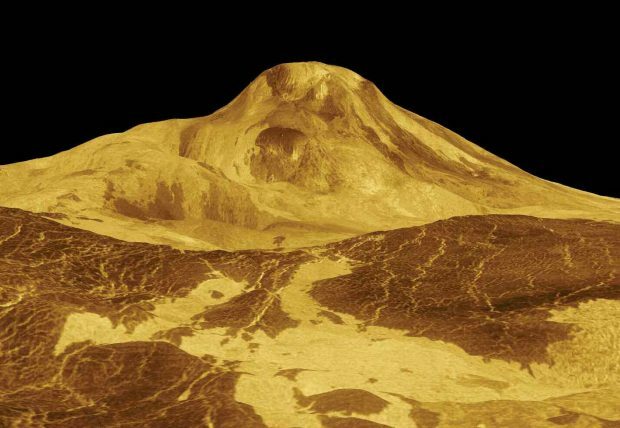 The scientists will use observations derived from radar data and topography of Venus to construct numerical models they will use to examine the evolution of stresses within the crust and uppermost mantle as a volcano is growing.